A classic look for cases and boxes. Catches have locking feature for added security and are keyed alike. Broad latch loop conceals mounting screws. Good quality, tamperproof, as the screws are all covered when locked unlike some of the cheap imports. Rich looking, adds to the quality of your display case. Smooth operating lock. I bought them on several occasions when making display cases. They worked great for my project. The shipping was fast and the price reasonable. It works great and is easy to install. I thought I would have to spend a lot more for good hardware but this had good quality for a great price. They look and work great. Easy to lay out and install. These latches appear to be the same as used by Browning on their shotgun cases. Very well made. Solid and fits perfectly with a small box in which I file photos. 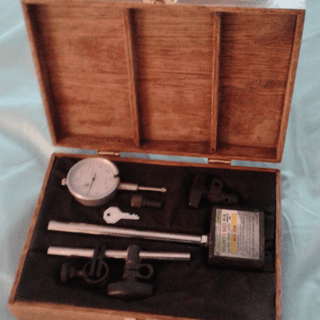 Can be used for any safe closure, small but very solid and professional looking. Goes on box quickly and looks good. Can't believe I found these latches so close to home. Perfect fit, didn't even have to change the lock. Only the latch. Cost next to nothing. 3rd set I have purchased Great quality. I had a great deal of trouble locating these items and was happy to find them at Rockler. I have even purchased some from the manufacturer, however with shipping there is no cost savings. Exactly what I was looking for. They worked great on the project I needed them for. I had looked locally for this type latch for the case I was building and was unable to find them. Then I went on line with Rockler and there they were. They were easy to install and worked perfect. And the price was right. I couldn't be more pleased. An exact match for the broken latches on the Browning gun case I was repairing. Though I had to wait a long time because of this item being out of stock, when it did come, it was exactly as described. The latches look nice on the jewelry box I made, but the lock part of it isn't that great. 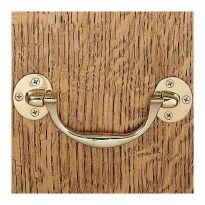 I have used these latches previously and expect to again. Shoirter screws would be better. Box sides ar about 1/4 thk and I have to grind screws to make keep them from intruding into the interior. It is a nice piece for my project. Will be great. I have the lock installed and it looks good and works fine. I hope the finish remain good. Perfect latch for the case I made for a chess set. Very reasonably priced. I made a couple of pistol cases and these were the right size and price. A little on the cheap side, but it's all I needed. Solved a problem I didn't think I could. Thanks. Just right for locking small chests. Aligns easily and looks good when inset in a 1/4&quot; deep dado. 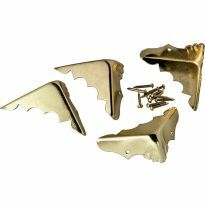 Very good quality latches at a reasonable price. The latches installed easily and work well. I am barely satisfied with the quality of the finish on the latches. 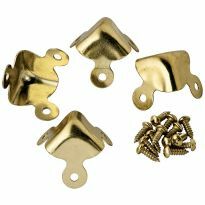 I ordered and received the 2-pack of these latches. I use only one per box so I was disappointed to find only one key in the package. Luckily I have the tools and ability to fabricate extra keys in my shop. Thin and cheaply made. Lock feature doesn't work. Spotty finish. 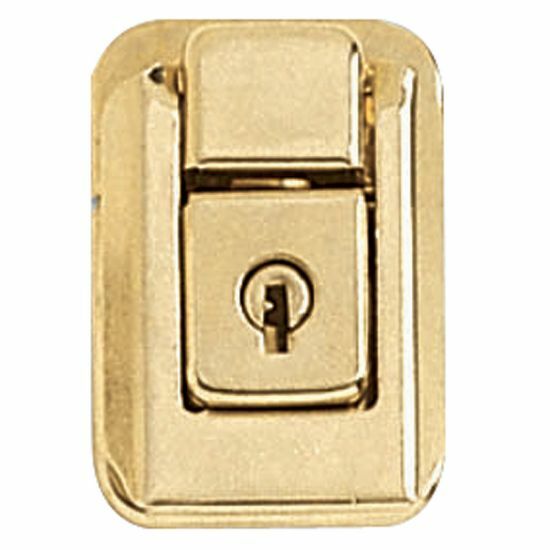 I wish I could find the same style in a quality latch. Mechanism in lock was hard to fit together with bottom after assembly. Hard to lock and unlock. Good for what it is. Does lock after a little modification of product. The keys are a very sloppy fit and the screws on the latch (top) half are to close to the edge so I fit a piece of 16 gage brass inside of it and and put screws in the other edge then put the latch over it and added the screws that came with it. the lock is hard to actuate, just feels like junk. Key and lock mechanism feel very cheap. I was able to open the lock with the key facing either direction... more of a latch, since it definitely provides no security. Ended up being totally unusable for my project. Thought it would work the best. I need to put lockable latches on a watch box. I’m hoping this item will work. Best ones I could find. Wish they made them in silver or nickle plate. Also wish they come with two keys instead of one? i have used these catches in the past and was very pleased with this product and rockler. It was exactly what I was looking for. Price and shipping were reasonable. they look like the ones I need to replace. 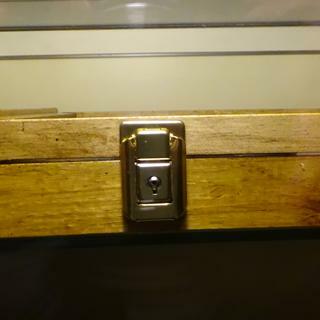 Needed a locking latch to secure lid on shadow box. Used these before. Worked well for the purpose. The small size will be right for the small case I am building. We are making memory boxes for residents that are starting to have memory loss and this product will make a finished box. i am makeing two display cases for a friend. to put on display case. Small lock box for teenager. Used before and cannot purchase locally. Needed replacement for latches on two Browning cases. Need a locking catch. This seems like what I needed. NEEDED SMALL LOCKING CLASPS ON WOODEN BOX PROJECTS. To place on a Walnut jewel box I'm making for my granddaughter. BEST ANSWER: Top piece with latch is 3/4 and the bottom piece is 1 1/8. Top piece needs at least 1" to work and the bottom needs at least 1 1/4. Hope this helps. Part where key is inserted: 1 1/4" x 1 1/8". 2 mounting holes on 1 1/4" side. 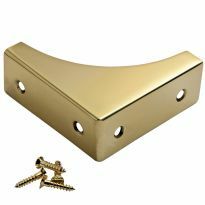 Upper piece with hasp1 1/4" x 3/4". 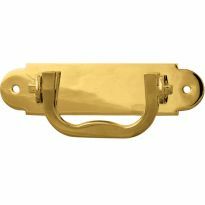 hasp in closed position 1 7/8" x 1 1/4". Mounting holes on 1 1/4" side. We don't have the lock in our possession, so we can't measure it. It is on an item that we gave as a gift. 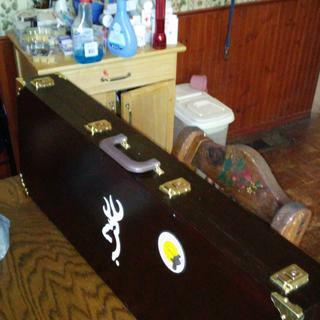 All I know is that the locks were a perfect match to my Browning shotgun case. 3/4" for the top, 11/8" for the bottom.........however, an 11/4" is better. It is 2 latches and only 1 key? BEST ANSWER: It is two lockable latches and two keys. Both keys open / lock each latch. Two keys if I'm not mistaken. No there are two keys. Does it come in pairs or individuals? BEST ANSWER: I purchased these for a musical instrument case, they came as a pair with keys. It comes as a pair (two latches), and two of the same keys. are these made in USA ? BEST ANSWER: These are made in the USA and were used for replacement locks on a Browning Shotgun case. They are the same as the old locks and fit the case perfectly. I believe they are made by ATCO in NJ. Is it possible to obtain duplicate keys for these locks? BEST ANSWER: I tried a couple of places and they could not make a duplicate key. I did find however when I bought more if these at a later date that the keys were all the same so I ended up with extra keys now. im sure you could make a new key with a file and thin metal if needed. key is not a secure locking tumbler style more like a skeleton key. I just want to verify that a set of 2 locks includes 2 keys -?- I build small cedar chests and only want to use 1 lock on each. BEST ANSWER: Yes, a package includes 2 locks and 2 keys.